The only man who stands to gain is Chris Algieri (20-1, 8KO). Not a legitimate welterweight, Algieri won the WBO title at junior-welterweight after out boxing Ruslan Provodnikov. So Algieri can once again boost himself by defeating Amir Khan (30-3, 19KO), with the broadcast beginning Friday at 9pm US Eastern on Spike TV or 2am on BoxNation in the UK. Given the bashing Khan received on social media, no one expects this fight to even be competitive. As a perceived light-punching junior-welterweight, there is little chance he can score a knockout. Likewise, he seems to not have the speed to better Khan's boxing ability. To be sure, if this fight is any way competitive, it will drag Khan's reputation through the mud. 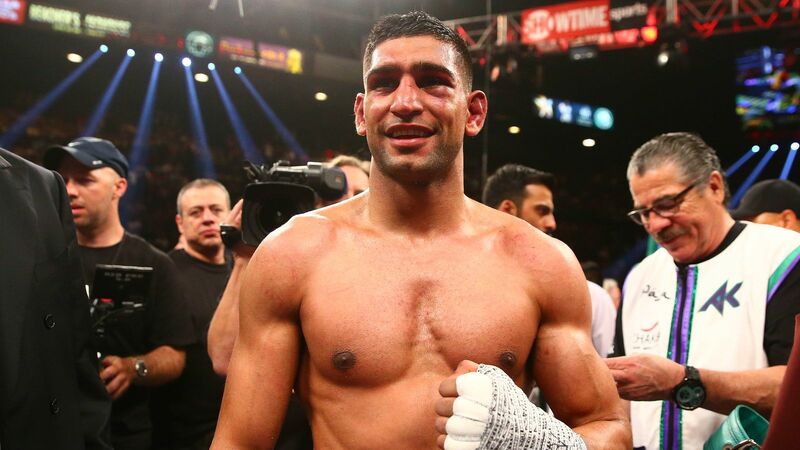 Indeed, Amir Khan is auditioning for a Floyd Mayweather fight. Similar to how Khan was chided for perceptively handpicking a soft toucher in Algieri, Mayweather was ridiculed as a cherry picker for entertaining the idea of fighting Amir Khan. This is why Mayweather created a poll in early 2014 asking his followers to select between Khan and Marcos Maidana as his May 2014 opponent. Maidana was not worth consideration...until he beat Adrien Broner in December 2013. Khan had passed on a fight with Devon Alexander in the same time period to avoid forfeiting his rightful place as Mayweather's obvious next opponent. In retrospect, Khan-Alexander was a mismatch in favor of Khan. However, Khan's December 2014 match with Alexander failed to sell out the MGM Grand, and the Timothy Bradley-Diego Chaves card on HBO outperformed Khan in the ratings. This made it even more convenient for the astute Mayweather to cherry pick a fight against Manny Pacquiao. Yes indeed, between Pacquiao and Khan, Pacquiao may have been the lower risk and higher reward. For, as a shorter fighter with a shorter reach and critique-able defense, this played into the hands of Mayweather who used his quickness, reach, and timing to control distance with counters and movement. Against Khan, who may be taller and longer than Mayweather, Mayweather might be forced to close the distance in pursuit – not ideal for someone who likes to pot shot out of the shoulder roll defense. For his part, Mayweather has said contradictory things regarding his next opponent. On the one hand, he claimed to be looking for easy opposition, the fight being more about the event (his last fight) rather than his opponent. On the other hand, he also said that he was looking for an opponent who would challenge him stylistically. The latter scenario clearly indicates a desire to face a box-and-move fighter, that is, an Amir Khan. Should Khan win too impressively against Algieri, the former case would seem to rule out Khan. I apologize for having pandered to the Khan-Mayweather back story. This is because it is a foregone conclusion that Khan will win in some fashion. Should Algieri get the upset, he will be given his just due. It seems to me that Algieri is focused on big paydays against big names. If he loses here, it will be his last. Look for Algieri to retire in the case of a loss, which he suggested he would do prior to his bout with Provodnikov. Fight preview and predictions for Amir Khan vs. Chris Algieri.